Women’s health has been a divisive political issue, and this year is no different. Following Trump’s inauguration, millions of men and women took to the streets, united in marching for women’s reproductive justice, access to healthcare, and their right to a safe college environment free of violence, among other issues. It’s hardly surprising why people showed up in droves to protest. Throughout the campaign trail, recorded evidence of Trump boasting of sexual assault and his past business dealings revealed a sordid and twisted relationship with women. The would-be president elect also expressed plans to repeal the Affordable Care Act and defund Planned Parenthood, which would put many women’s lives and reproductive health at risk. Healthcare providers have become more and more concerned about the impacts that these changes in legislation could have on women’s health, particularly medical professionals that regularly work with the female population–especially those who rely on Medicaid and Planned Parenthood to provide the healthcare services that they need in order to survive or receive basic care. It’s a situation that many healthcare providers are trying to avoid. “We want women to have access to anything they need to make the right choices for their bodies,” fourth-year medical student Kate MacMillan argues. Although the ACA is not without its flaws, many reports have concluded that repealing the legislation entirely has disastrous consequences for individuals who rely on ACA provisions in order to meet their basic healthcare needs. Republican alternatives to the ACA pose threats to women, the elderly, the disabled, and young people looking for health care access. Of course, this is hardly the first time that women’s healthcare has garnered national attention. Women’s health has been a hot button issue for decades. Reproductive rights in particular receive an undue amount of scrutiny from policymakers. In 2011, for example, issues related to reproductive health received unprecedented attention. According to reports by politicususa, “In the 50 states combined, legislators introduced more than 1,100 reproductive health and rights-related provisions.” Most of these provisions were put in place to restrict access to abortion and reproductive services. 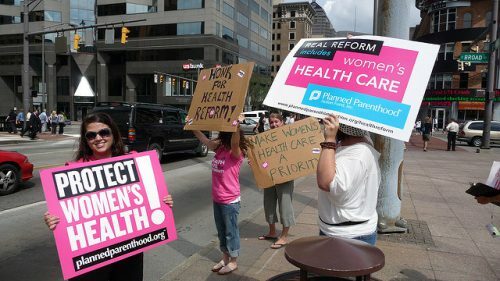 Conservative congress members have also done a disservice to many in helping to spread false information about the “dangers of contraception.” In 2012, a New Hampshire lawmaker asserted that the government should deny access to contraception for women, because she believed reports that birth control causes prostate cancer. While it is true that some forms of birth control can cause negative side effects, Representative Notter’s comments are misleading at best, according to the author of the cited study. Of course, reproductive access isn’t the only issue healthcare professionals are concerned about. The healthcare field in general still has many hurdles to overcome that have little to do with access, and more to do with the ways that medical professionals diagnose and research serious health conditions. For instance, women’s heart attack symptoms vary greatly from their male counterparts, and even today, many women are misdiagnosed simply because medical professionals are unable to quickly analyze and come to an appropriate solution to their health problems. Similarly, women are often underdiagnosed for medical complications ranging from hernias to mental health conditions. For now, it’s clear that the fight for access to adequate and thorough health care access is far from over. “Right now, women’s health is in greater danger than it has been at any time in the last 3 or 4 decades,” Kyle Ragins, M.D. tells Medscape Medical News. These problems are part of the reason that protests have been so successful throughout the Trump presidency. Throughout U.S. history, women have consistently had to fight for their rights, for reproductive access and bodily autonomy, and for the medical community to take their differing needs seriously. Unfortunately, conservative actions in the U.S. continue to undermine the progress that women have fought for–and will continue to fight for. Corporations Possess; Public Access Is Torn: Télévision Vérité. Liebography. Posted in Social Justice Blog and tagged Trump Train, Women's Health. Bookmark the permalink. Trackbacks are closed, but you can post a comment.